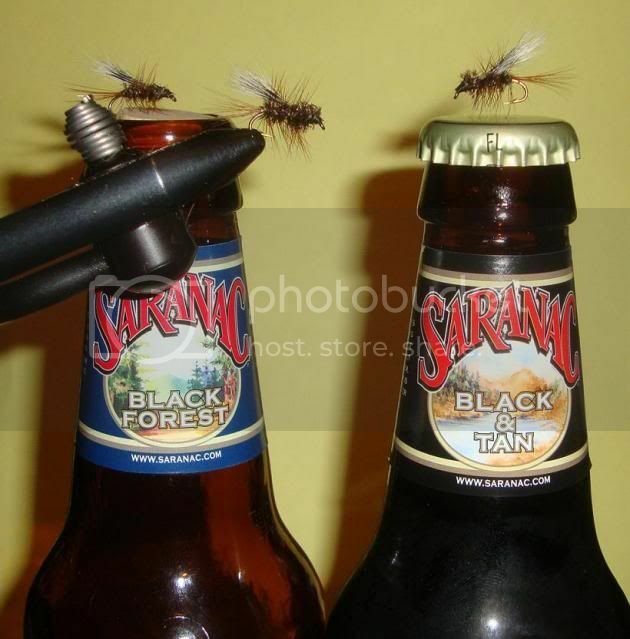 After tying up some #16 black stoneflies, and a few beers, i needed to tie something a little bigger and easier. The Picket Pin has been around for a long time. 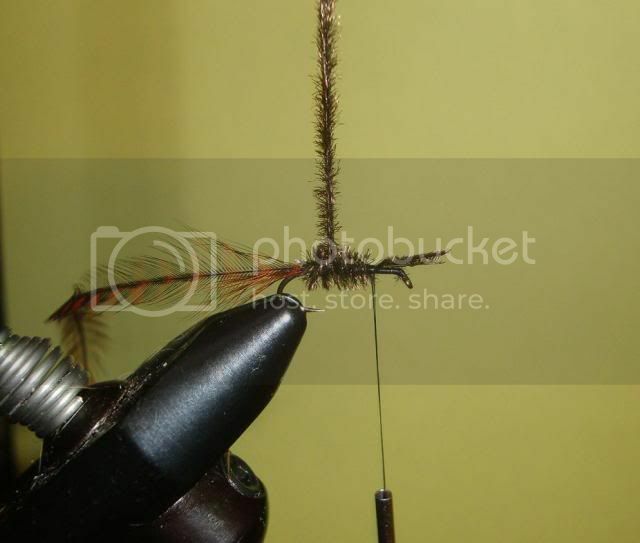 Troutslammer has found out a picket pin works very well as a wet fly during a stonefly hatch. here's my version which can be tied with a few items found around the house or on the porch!! pop the bothersome squirrel and save the tail. 3. tie in two strips of peacock herl by the tips. NOTICE how far back from the eye the herl is tied! 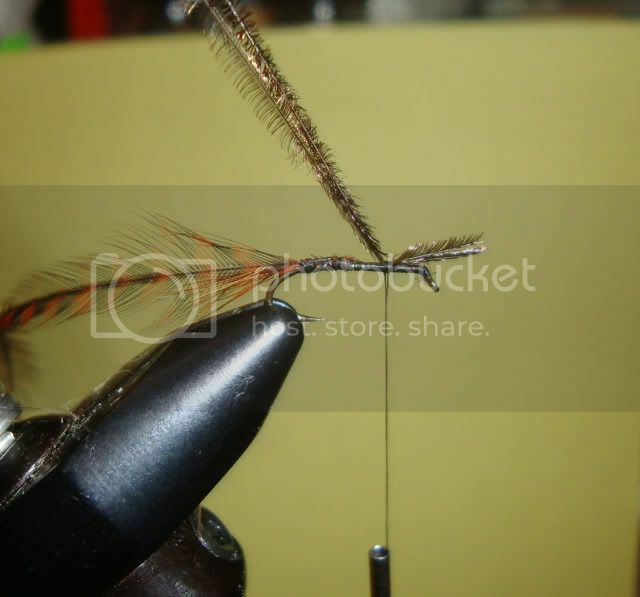 4. wind the herl to the back end of the hook shank and than back up towards the hook eye. 5. tie off herl as shown, still back from the hook eye. leave ends uncut. you can trim the left over tips nearer the shaft now. 6. palmer the saddle hackle to the place where the herl was tied off. 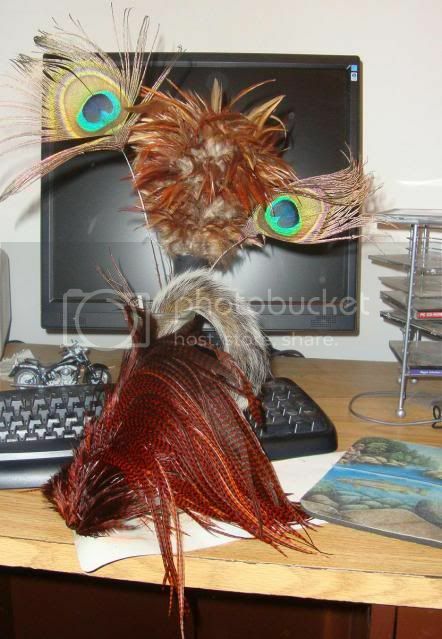 7. take a small clump of squirrel tail, you can use a hair stacker to even the tips, and tie in at shown point. 8. trim squirrel butts. bring thread around herl to front of hook and cover trimmed hair. 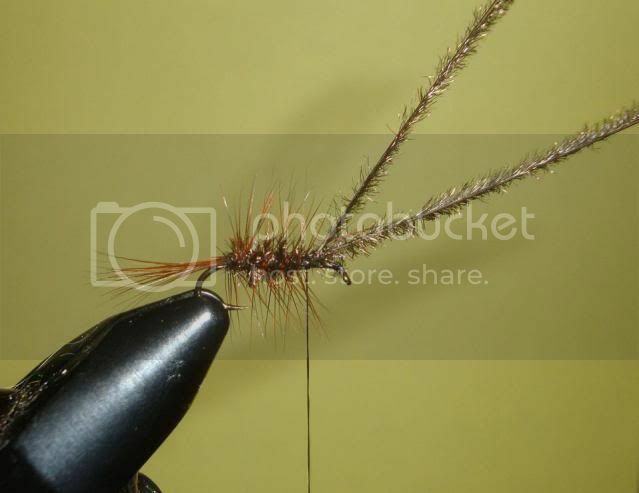 9. wrap thread over herl close to shaft, back to the tie off point of squirrel as shown. herl should be standing upward. 10. bring thread to just behind hook eye. wind ends of herl towards eye. tie off, trim and whip finish. 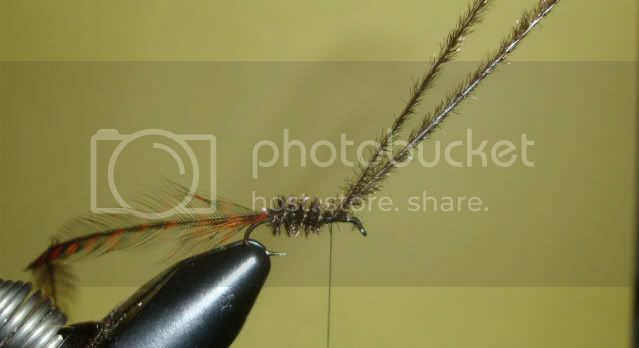 My first steely on a fly was with a picket pin. Also, the biggest brookie I ever caught was taken on that fly. The brookie was taking hoppers against the bank, under some overhanging branches. That I know because I was the one feeding it. 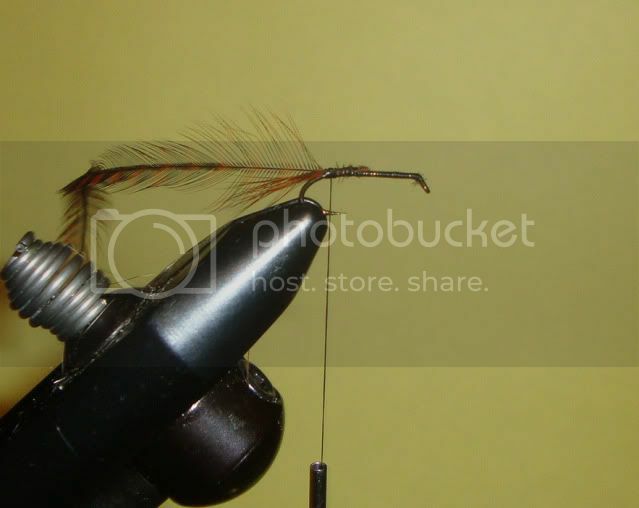 I didn't have a hopper pattern on me so I tied on a picket pin and dowsed it with floatant. Nice lookin fly. I think it was Jokerball that told me he did good on these early in the season last year. DT - great tute and a great pattern!!!! The PP is a great go to. And thanks much my friend for keeping the tutes active. It's been too long since I've been at the bench - just gotta find the time to get back to it....and this weekend I hope to be able to knock the dust off a bit. Thanks again Jerry. "They say you forget your troubles on a trout stream, but that's not quite it..... you begin to see where your troubles fit into the grand scheme of things, and suddenly they're just not such a big deal anymore." Dt, nice saddle you have there. 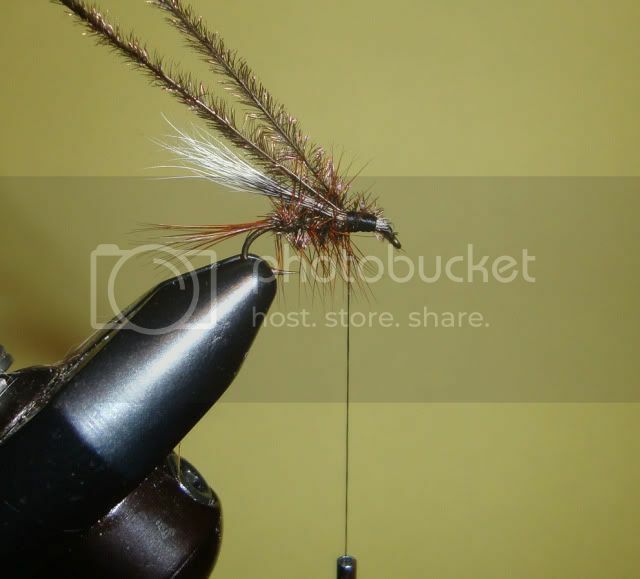 picket pins and many other wets are a go-to when stockies shut down on nymphs and streamers... for me anyway. Love fishing the picket pin and usually wrap a few up at a time. Just a suggestion that might help with the squirrel tail wing. I'll make a bunch of these ahead of time by getting the amount I want then take the end closest to the tail and coat it with hard as nails. Keeps the hair together then store them in a plastic box and they are ready to go and make tying in a lot easier. Just my 2 cents. A bad day fishing is always better than a good day working. 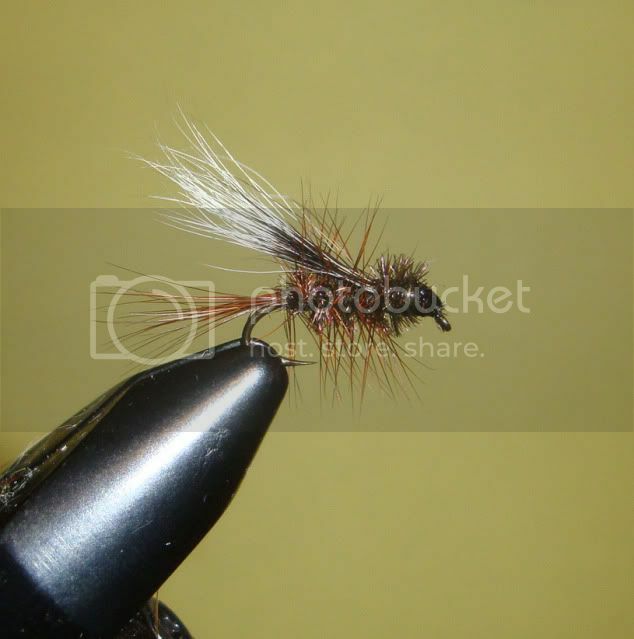 Interesting enough I looked for a pattern for this fly yesterday. Remembered years ago while fishing the fly area of little Mahoning creek in Indiana county, I came across an Ol' timer who was using an interesting rig. He had two picket pins tied on, followed up with a wooly bugger. He was using sink tip fly line and if I remember correctly the leader and tippet total length was very short. He said he used both black and olive buggers, and that was all he ever fished with. I asked him about keeping them from tangling and he said he wold buy packs of snelled hooks, cut off the hooks and use that short piece of line to tie on the pins as droppers off the main leader. Double taper, gone but not forgotten. Hey bigfoot I have used the picket pin in early and late spring with great success on both the Little Mahoning and the Project waters of Laurel Hill. Thanks for the info. I have yet to fish the Laurel hill. Yeah I fish the section down by Humbert where it runs through the State game lands. Easy access at the game lands parking lot but can get crowded depending on weather and how hot it is, locals like to swim the big hole under the bridge. Productive water or used to be the whole stretch to the lower end but didn't get a chance to fish it last year so not sure how it has changed. Mayfly hatches are sporadic except for Sulphur's and Slate Drakes come off (or used to) in good numbers. I've always done good on soft hackles and ants along the banks. Hope you get a chance to check it out. The section near the state park by the boy scout camp I haven't fished in a few years but it can be good in early to late spring or evenings in summer.